Ayurveda is an ancient system of healing from India and literally means ‘The Science of Life’. Its purpose is to heal and maintain the quality and longevity of life, and offers a profound understanding of each person’s unique body, mind and consciousness. Ayurveda concerns itself with all aspects of living: diet, lifestyle, yoga, meditation, cleansing practices, and healing herbs. What is most empowering about Ayurveda is that it puts the focus on self-healing. Through the different lifestyle practices, we are encouraged to take responsibility for our own health and thus prevent disease. 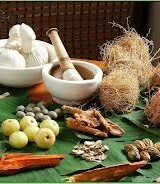 In an Ayurvedic consultation, the practitioner will determine your unique constitution (prakruti) as well as the current imbalance (vikruti) in your body. During this appointment, diagnostic tools such as pulse reading, facial, tongue and eye diagnosis are used together with questioning and reviewing of your health history. Based on this assessment, the practitioner will design a unique treatment plan for you which aims to heal the root cause of imbalance in your body. Ayurveda is based on the principles of the doshas, your unique constitution that consists of the five elements of Ether, Air, Fire, Water and Earth. These elements are present in all living beings and indeed, the whole world. A person’s Ayurvedic constitution is made up of these elements, too, and is classified as Vata (Air & Ether), Pitta (Fire & Water) and Kapha (Water & Earth). In the consultation, the practitioner will determine which of the elements in the client’s body are out of balance and suggest practices that will restore harmony to body, mind and spirit. Typically, these practices consist of changes in diet and lifestyle, yogic breathing practices and postures and sometimes, the use of Ayurvedic herbs. Many chronic conditions and general ailments can be alleviated and cured with a few simple adjustments. All consultations include e-mail support. Learn how to balance your constitution with pacifying and invigorating yoga postures and breathing exercises. This class is designed to help you to set up an Ayurvedic kitchen. It can take place in your home and can be as simple or comprehensive as you would like it to be. Learn how to use the best utensils, spices, shopping and cooking methods for the freshest, most wholesome Ayurvedic food. I also offer a variety of workshops. Workshops can also be designed for you upon request. I work internationally so enquiries are welcome from all parts of the world. Please contact me for bookings and pricing. Click here to download a PDF with more information on how Ayurveda and Yoga have helped me.